The wind was so strong when the 2013 Governor’s Cup was scheduled to start that organizer Ralph Vatalaro decided to postpone for half an hour. Then another half hour. And some of the entrants decided it was still too much and turned back to the city. They missed a nice day on the water. 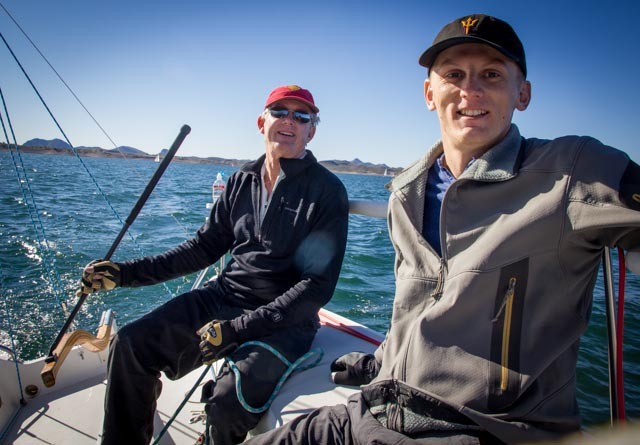 Wind slowly dropped in velocity, but still the first boat across the finish line, Paul Liszewski’s Hobie 33, Rollin’ in the Deep, covered the 26 mile course in less than four hours. Chris Smith’s J/80, Sloop Dogg, was close behind. 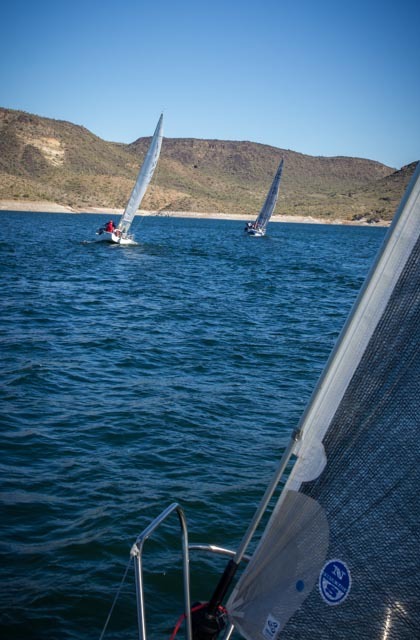 When the PHRF handicap was applied, a visitor from Las Vegas corrected over both to win possession of the big cup (click here for scores). Glenn Frank towed from Las Vegas for the event and since he might need a bigger trailer to tow the trophy home, we’ll plan to put it on display in Tempe. Go for a wild ride on Rock Star Victor Felice’s Mermaid Rescue. Thanks to Ralph for putting the race together, based on Mike Parker’s course design.